REDDING, Calif. – Students and faculty in Simpson University's Master of Arts in Counseling Psychology department are making sure that a local family in need will have a Christmas to remember this year. As a department, the individuals randomly chose a Shasta County family of four to "adopt" through Northern Valley Catholic Social Service's "Adopt-a-Family" program. The director of the MACP program, Addie Jackson, said, "As Christians we have a calling to serve people who have less than we do. This was a wonderful opportunity to have our students involved in." Program staff delivered over 70 wrapped presents and gift cards to local grocery stores to NVCSS for them to distribute to their chosen family. "I was so amazed with the students' generosity and enthusiasm," said Jackson. "They really got behind this project and demonstrated their compassion for a local family that needs some support right now." 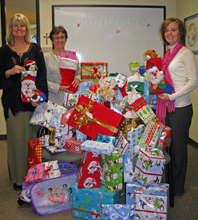 This year, NVCSS had 676 families in Shasta County who were in the "Adopt-a-Family" program. There were an additional 520 families in Butte, Tehama and Siskiyou Counties combined. "Hopefully we'll make this an annual tradition," said Jackson. "We want the community to know that Simpson University is involved in our community in as many ways as we can be." For more information about NVCSS or the "Adopt-a-Family" program, visit www.nvcss.org or call 241-0552.